TS Model School 6th Notification 2019 download @ telanganams.cgg.gov.in. Telangana Model School Notification For 6th Admissions 2019 TSMS Online Apply Schedule. Download for TS Model School 6th Class Admission Eligibility Criteria, Selection Process and How to Apply Online Application form. Telangana Model School Notification For 6th Admissions 2019 – Online Apply TSMS Admissions 2019. The Commissioner of School Education, Govt of Telangana released TS Model School Result 2019 for the Admission Test. The Commissioner and School Education Department officials issued the TS Model School 6th Class Entrance Test 2019/ TSMS CET 2019 Notification in the month of Janaury 2019 for admission into VI class in Telangana Model Schools for the academic year 2019-2020. 5th Class to 6th Class Admission Online applies Process and TS Model School 6th Notification 2019 at telanganams.cgg.gov.in. తెలంగాణ రాష్ట్రంలోని తెలంగాణ మోడల్ స్కూళ్లలో 2019-20 విద్యాసంవత్సరంలో చేరేందుకు ఏప్రిల్ 13న ప్రవేశ పరీక్ష నిర్వహించాలని పాఠశాల విద్యాశాఖ నిర్ణయించింది. దరఖాస్తుల స్వీకరణ నోటిఫికేషన్ సోమవారం విడుదల చేయనున్నట్టు పాఠశాల విద్యాశాఖ డైరెక్టర్ టీ విజయ్‌కుమార్ శనివారం తెలిపారు. వివరాలకు http:// telanganams. cgg. gov. inను సంప్రదించాలని సూచించారు. 2) Rs.50/- for SC / ST and BC students. For any problems call Ph: 040 23120335, 040 23120336 (Call Time : 10.30 A.M to 1.00 P.M & 1.30 P.M to 5 P.M on working days) Download TS Model School 2019 for 6th Class Admissions. Tags: TS Model School Admissions 2019, TSMS 6th Admissions 2019, TS Model School 6th Admission Notification 2019, TSMS Online Application Form, TS Model School hall tickets, results of Telangana Model School, Telangana Model School 6th class Admissions. 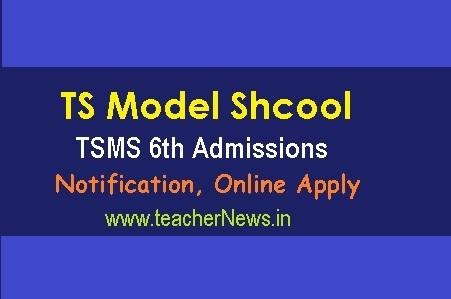 TSMS 6th Class Admission Notification For 6th Admissions 2019 – TS Model School Online Apply For VI Admissions 2019.